For other uses, see Alex Lowe (disambiguation). Lowe was widely admired by his peers for excelling in every aspect of mountaineering, from rock- and ice-climbing to ski descents. Dave Hahn once remarked, "There's Alex Lowe up here, and then there's the rest of us down here. The guy's just really that much better than everybody else." and Conrad Anker said, "We're all at this one level, and then there's Alex." Lowe himself said "The best climber in the world is the one having the most fun!" Lowe improved his upper body strength as a result of an exercise regimen that included 400 chin-ups and hundreds of dips. In an article for Active Lifestyle, Gordon Wiltsie, a photographer who climbed with Lowe in Antarctica and Canada's Baffin Island, said, "he'd hog the pull-up bar to knock out 400 pull-ups in sets of 40 and 45. He disliked downtime and knew where to do pull-ups in many airports. Even on expeditions, when rest is hard to come by and much appreciated, Lowe was an oddball. He'd cop pull-ups on a ship's rigging en route to Antarctica, or do dips in a snow pit he dug at base camp." In that article, Wiltsie said, "At Baffin Island, after hauling supplies to a high point on a climb, we went back to camp beat and tired, but Alex proceeded to do pull-up after pull-up. He even brought an exercise device on climbs." He was known jokingly as "Lungs With Legs" for his incredible strength and stamina. In June 1995, Lowe helped the National Park Service rescue several Spanish climbers on 20,320-foot (6,190 m) Denali in Alaska. On 9 June, the group had been trapped for four days at 19,200 feet (5,900 m). Before a rescue team could assemble, one of the climbers fell 4,200 feet (1,300 m) to his death from the mountain's Upper West Rib. The surviving climbers were all suffering from hypothermia. Lowe and two fellow climbers were lifted by military helicopter to a plateau above the Spaniards, scaled down a 400-vertical foot, 50-degree slope of ice and rock, to reach them and determined that one needed immediate evacuation. Amid snowy conditions, he at first dragged, then carried him on his back up the steep slope at high altitude. In September 1999, Lowe, Conrad Anker and David Bridges (a two-time US national paragliding champion) traveled to the 26,291-foot (8,013 m) Himalayan giant Shishapangma, the fourteenth highest peak in the world, as part of the 1999 American Shishapangma Ski Expedition. On 5 October, they split into two teams as they searched for a route up the mountain. Lowe's group (Lowe, Anker and Bridges) were crossing a flat glacier when a large serac broke loose 6,000 feet (1,800 m) above and tumbled downhill. The 500-foot (150 m)-wide avalanche swept over the three men. Anker was thrown 100 feet (30 m) by the windblast, and suffered a lacerated head, two broken ribs, and dislocated shoulder, but emerged from the snow, and led a 20 hours rescue attempt in the large debris field measuring up to 20 feet (6.1 m) deep. Neither body was found at the time, but almost seventeen (17) years later on 27 April 2016, climbers Ueli Steck and David Göttler, came across the remains of the two climbers emerging from the glacier. Jennifer Lowe-Anker published a memoir, Forget Me Not in 2008, that recounts her life shared with Lowe, his death and the life she continued with Anker. Forget Me Not won the National Outdoor Book award for literature in 2008. In 1995, Lowe received the American Alpine Club's Underhill Award for outstanding mountaineering achievement, the highest honor in U.S. mountaineering. He climbed for nearly 10 years with The North Face professional climbing team, which included in the later years mountaineer Jon Krakauer, author of the bestseller Into Thin Air. After Lowe's death, Outside Magazine posthumously declared him "the world's best climber," adding, "No matter how jaw-dropping his routes, Lowe's real genius grew out of the way he combined physical accomplishments with an indomitable spirit." Formerly known by its elevation as Peak 10,031, Alex Lowe Peak, south of Bozeman, Montana in the Gallatin National Forest was officially named after him in September 2005. In spring of 1997, Lowe had climbed the northern couloir with friend Hans Saari; and the two had made the first ski-descent from the summit, down what they named "Hellmouth Couloir." Mount Rundle, Canadian Rockies, spring 1996, "Troubled Dreams", first free ascent of one of the most difficult mixed climbs in the Canadian Rockies. ^ "Climber Remembers the Legendary Alex Lowe", (quote from Conrad Anker), story by Andrew Bisharat, May 2, 2016, nationalgeographic.com. ^ americanalpineclub.org, pdf version of AAJ 2000, p. 441 (the motto of In memoriam: Alex Lowe 1958-1999, pp. 441-443, by Gordon Wiltsie). ^ "Bodies of elite climber, cameraman buried in 1999 found". Retrieved 6 May 2018. ^ Richard Mackenzie (9 March 2012). "The Life and Death of Mr. Invincible". Retrieved 6 May 2018 – via YouTube. ^ "BBC News - World - Cyber reports of mountain tragedy". news.bbc.co.uk. Retrieved 6 May 2018. ^ "Tales from Alex Lowe". www.mountainzone.com. Retrieved 2016-05-03. ^ Heller, Seth. 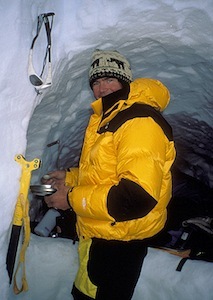 "Alex Lowe's and David Bridges' Remains Found on Shishapangma". Rock and Ice. Rock and Ice. Retrieved April 30, 2016. ^ "The Believers", Conrad Anker, December 2005, Outside Magazine. ^ everestnews.com "Alex Lowe Peak": A Mountain Honoring a Mountaineer [with photograph, localization and the climbing history of the peak] (retrieved March 27, 2010). ^ alexlowe.org/peak.shtml "Alex Lowe Peak": A Mountain Honoring a Mountaineer. Retrieved March 27, 2010. Outside magazine, December 1999 Rock Star. Alex Lowe's genius was his style and spirit (Obituary, with list of major ascents). Retrieved March 27, 2010.